In Israel, and particularly in Jerusalem, there are more churches and institutions belonging to different Christian denominations than in any other place in the world. Only a few know the history of all of them; occasionally you will see a church and not be able to find any information about it. This guide will help you recognize which denomination it belongs to by referring to the flag on the roof of the building or the symbol displayed in front. 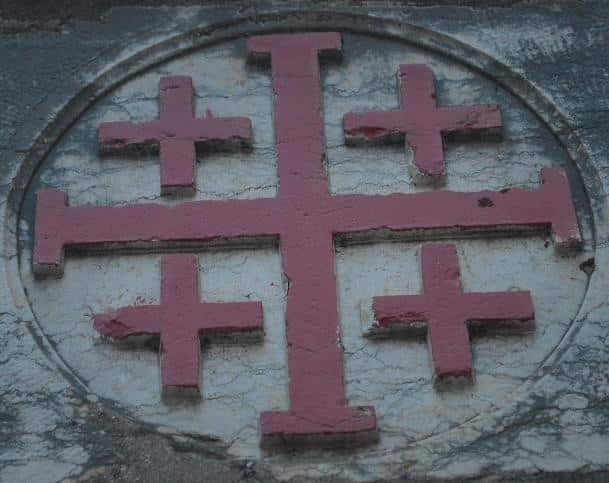 The Jerusalem Cross is a cross with four equal arms and four small crosses in each corner. The first to use the cross was Godfrey of Bouillon, who was the first ruler of the Kingdom of Jerusalem. It is mostly but not only to be encountered as a symbol of Catholic institutions. The cross of Jerusalem became the symbol of pilgrims and is sold as jewelry in many souvenir shops. The Custody of the Holy Land belongs to the Franciscan Order and its mission is to guard the holy sites of the Catholic Church in the Middle East. The upper part features a crown symbolizing the Father and ruler of heaven and underneath the crown is a dove symbolizing the Holy Spirit. The bare arm belongs to Jesus and the sleeved one to St. Francis. On the palms of the hands you can see a small cut that symbolizes the nail in Christ’s hand and the marks of the stigmata – the wounds where nails pierced Christ’s body (according to tradition, St. Francis was the first to have the stigmata wounds appear on his body). 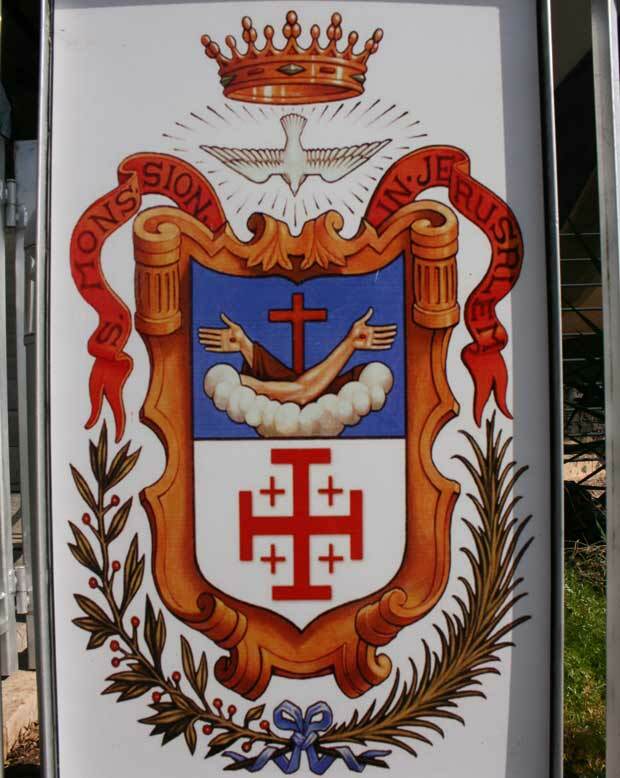 Below this is the Jerusalem Cross. The inscription “S. 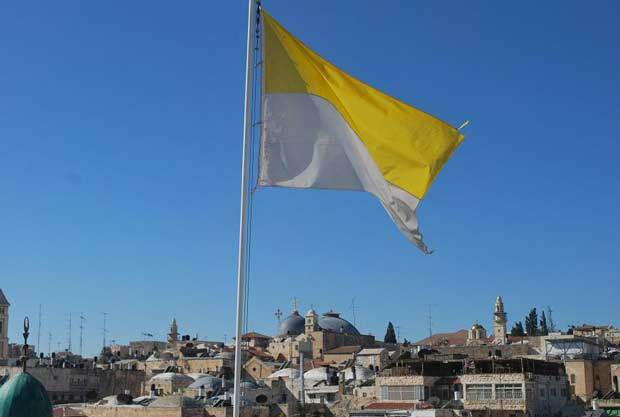 Mons Sion in Jerusalem” refers to one of the main Franciscan sites in Jerusalem – Mount Zion. Two branches wrap around the lower part of the symbol. One is an olive tree branch that symbolizes Jesus as the Messiah (his body was anointed with olive oil) and the other is a palm branch. Jesus was welcomed into Jerusalem by people holding palm branches in the last week of his life. Half of the flag is white and the other half is yellow. The flag was adopted by the Vatican in 1921. Sometimes a pair of crossed keys is depicted on the white half. These are the keys to heaven, the symbol of the Pope. Jesus gave the keys to St. Peter, who is considered by Catholics to be the first Pope. This flag is flown above buildings belonging to Catholic countries and institutions. In the Greek alphabet, Alpha is the first letter and Omega the last. This symbol represents Jesus’ words: “I am the Alpha and the Omega, the beginning and the end” (Revelation 1:8). 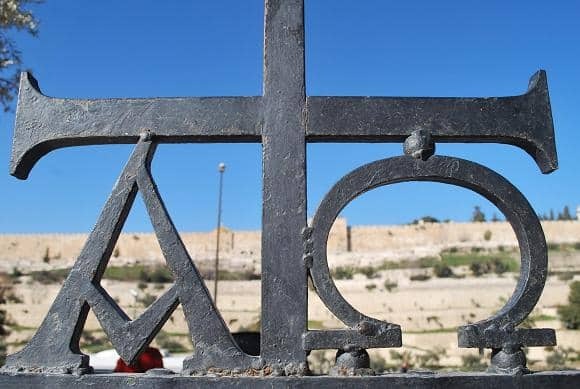 Even though this symbol contains Greek letters and is associated with the Eastern Orthodox Church, it’s actually more commonly seen in the Roman Catholic Church. These are the first two letters of the word “Christos” (Messiah) in Greek. It was first used in 312 by the Roman emperor Constantine. 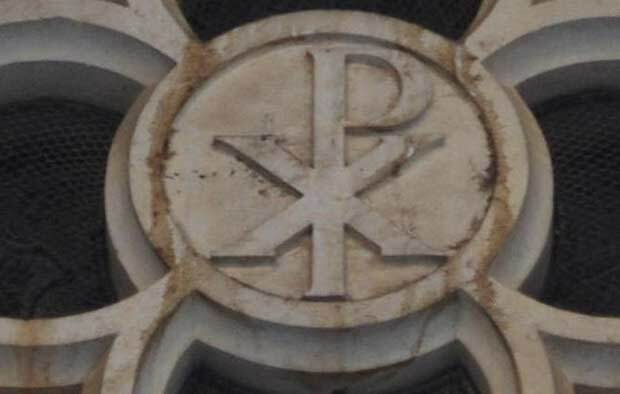 According to tradition, before the Battle of the Milvian Bridge, Constantine had a dream in which he was told that he would win with this symbol, the Chi-Rho. That morning he ordered his soldiers to mark it on their shields. After he won the battle, the Chi-Rho came to be the symbol of the Roman Empire. Constantine was the first Roman emperor to stop persecuting Christians and later made Christianity the religion of the Roman Empire. The Chi-Rho is one of the oldest Christian symbols and is usually but not only used by the Roman Catholic Church. It is often combined with the Alpha and Omega. The East-West Schism of 1054 divided the Church in two: the Eastern Orthodox Church and the Roman Catholic Church. There are many reasons for the division – geographical, political and theological. Of all the different orthodox churches, the Greek Orthodox Church owns the most property in Jerusalem. 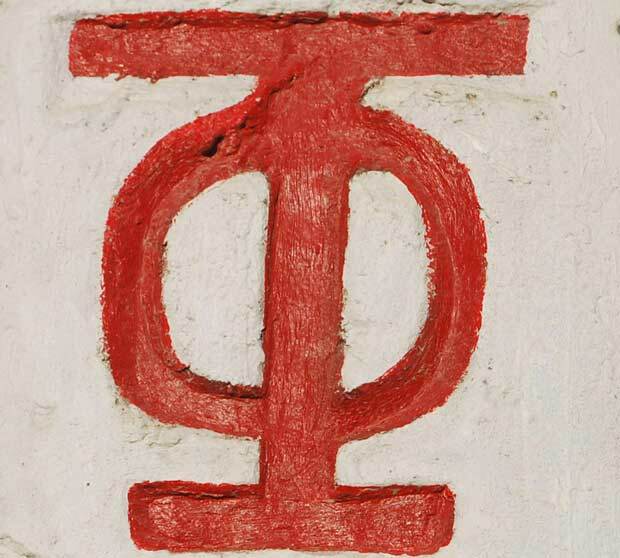 Their symbol is called “taphos” and is composed of the Greek letters “tau” (T) and “phi” (φ). These two letters spell out the word “tomb” or “sepulchre” in Greek and symbolize the sacred burial place of Jesus. The symbol can be seen throughout Jerusalem. 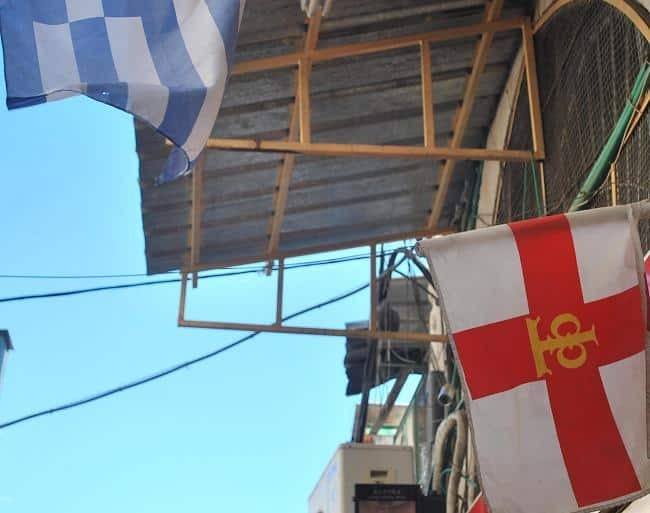 This flag features the taphos in the middle of a red cross. Usually a Greek flag will be flying right next to it. Until 150 years ago the language of prayer was Greek but in recent generations it has been changing to Arabic. Unlike the Catholic Church, in which the Pope is the highest authority, the Orthodox Church is divided into regional churches, one of them being the Russian Orthodox Church. In the 19th century, as the Ottoman Empire was getting weaker, many other empires, and the Russians more than others, bought properties in Jerusalem and built churches and facilities for Russian pilgrims. 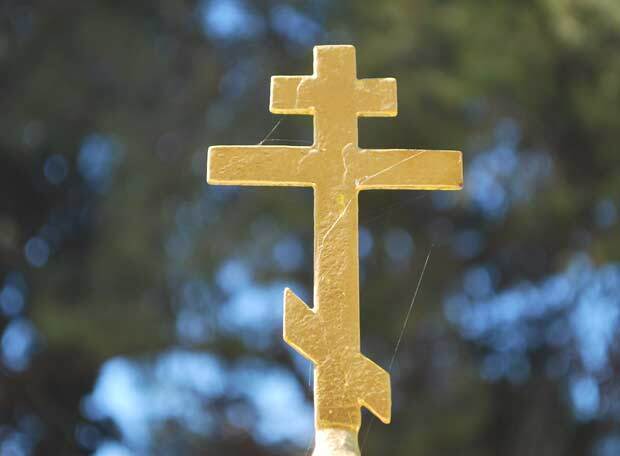 This is the symbol of the Russian Church. The lower horizontal beam is at an angle, resulting in a left side that is higher up than the right. According to tradition, Jesus was crucified between two thieves. The one to Jesus’ right, Dismas, was a penitent thief, while the other, Gestas, taunted him. Therefore the beam points upwards on the side of the penitent thief and slopes downwards to symbolize the impenitent thief. The Armenians were the first nation to accept Christianity as a state religion. 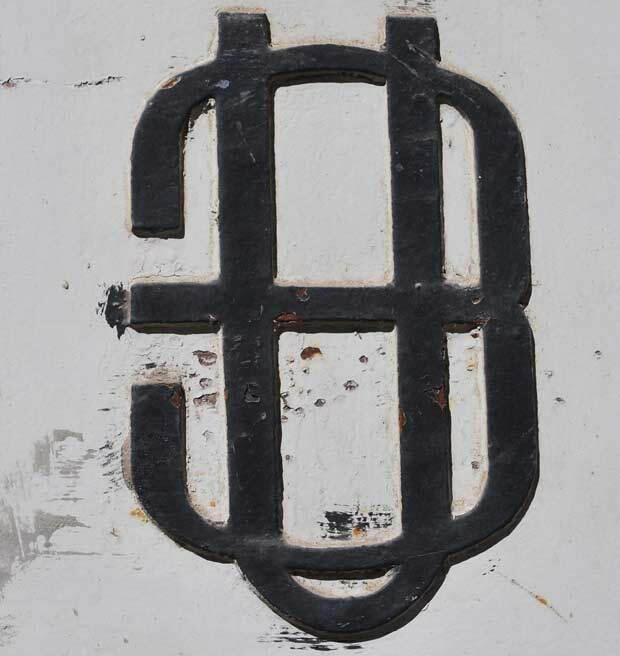 The symbol is composed of the first two letters of the Armenian words for “holy” and “Jacob” (or “Santiago” in other languages): Յ (sourp) and u (hagop). With this symbol the Armenians wished to commemorate both St. James, Jesus’ disciple, and James, Jesus’ brother, who stood at the head of the Jewish community in Jerusalem. 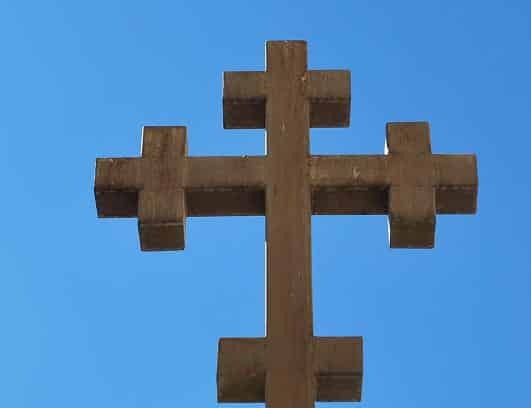 This is the symbol of the Copts, the Egyptian Christians. Up until the 12th century the Copts formed the majority of the population in Egypt. Today they number about 15%. They do not own a lot of property in Jerusalem, but the ninth station of the Via Dolorosa, right above the Church of the Holy Sepulchre, belongs to them.